SP Member EGIDIO P. ELIO, M.D. We are aware that mining offers certain economic benefits such as short-term employment, increased exports, potential tax revenues, and huge gains for the mining companies. But these will not make our province rich or free our people from want and poverty. Our grandfathers took care of our land that we may inherit it pristine and beautiful as it is today. We commit to protect and keep it pure and unspoiled for our future generations. 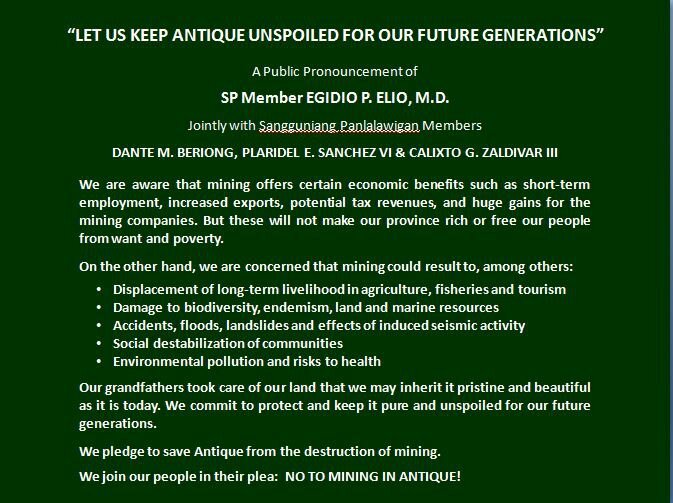 We pledge to save Antique from destruction of mining. We join our people in their plea: NO TO MINING IN ANTIQUE!